The contest is part of a Syracuse University-wide news app competition. The newly-added Journalism category allows a wider variety of mobile content than just apps, including multimedia eBooks, mobilized WordPress sites, and magazine apps created with commercial tools like the Adobe Digital Publishing suite. 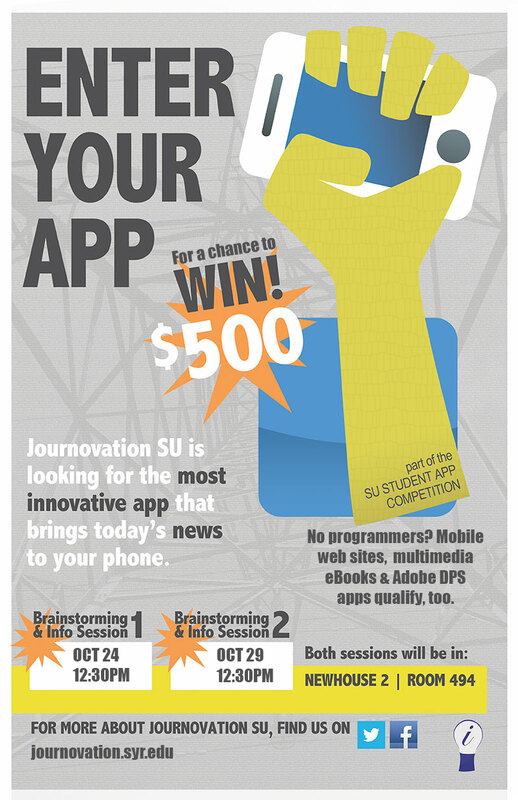 The winner of the news category will receive a $500 prize, funded by the Horvitz Chair of Journalism Innovation, and the winner will be announced on November 28 at a campus-wide “Entrepalooza” event. Entries must be placed at the site above by November 9, which is coming up soon. But the project itself does not need to be completed until demo day, giving students an entire month to complete and enhance mobile projects. Following are the current rules for journalism entries. Note that you do not necessarily need to work with a coder to apply (although that can help), as you’re also allowed to use free software for a web site, Adobe tools, or even a tool like iBooks Author to create a multimedia eBook. Apps or mobile-optimized sites or services whose primary goal is to provide important civic information to targeted geographic or topical communities. Entries in this category must incorporate standard journalistic principles of truth, accuracy, fairness and ethics and seek primarily to inform rather than persuade. Judges will give preference to applications that make use of features that are unique to mobile devices, such as geolocation and user contribution. Innovation: How unique and creative is the app? Are there similar ideas out there? What makes the app better than others? Integrity: How robust is the app? Is the app just a functioning prototype or well-tested and ready for release? Impact: How useful is the app? Who will be using it? How will it change people’s lives and society? At least one team member must be a full time SU student. Both graduate and undergraduate students are eligible. There is no limit on the number of team members. In order to receive an award, at least one team member must have the legal status to receive a monetary prize. At least 50% of the code must be written by the team members (which must be either current Syracuse University students or 2012 graduates of Syracuse University), with the exception of the use of software libraries (e.g. APIs, SDKs) that are available to the public through licensing, which may be proprietary or non-proprietary. The majority (more than 50%) of the code must be written during the 2012-2013 academic year by the SU students on the team. Each team must demonstrate the functioning app at the Demo Alley section of Entrepalooza, on the day of the competition, after passing the first round of judging. Each team can submit only one app and each individual in the competition can belong to only one team. Each application must include all the required information on the application form. The entire source code is not part of the application. However, the source code of the app must be accessible to the judges and organizers upon request after the submission through the period of competition. Each team must be the legal owner of the entire software submitted to the competition. A submission may be disqualified if it fails to comply with any of the requirements above.